Holland Lops are the smallest of the lops. 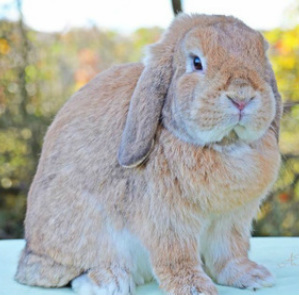 The Holland Lop is supposed to have a massive look, but be a small bunny. The standard says the ideal weight is in the 3-pound range, but breeders find their rabbits pushing the 4-pound limit as they select for thicker bone and more solid, heavyset bodies. The head should be large and bold. The ears should be short, thick, and round in shape. There are a number of ear faults, such as thin ears, rolled ears, or a “tight crown” which causes the ears to stick out to the sides instead of fall against the side of the head. The body should be short and muscular, with shoulders of nearly equal depth and width as the hindquarters. The coat isn’t worth many points in the Holland standard compared to type, but it should be a gentle rollback. Properly typed Holland Lops have heads that are set high on the shoulders. A Holland’s head should never be pushed down to the table when judging, but the rabbit should be allowed to show off its natural head mount. These bunnies generally have nice personalities and are popular as pets. They come in a variety of colors however, torts are the most common. The Mini Lop is a very popular rabbit breed that is featured in numerous rabbit shows throughout the United States. Like any animal, Mini Lops come in a variety of personalities but, most often than not, they are fairly friendly and extremely playful. They are also very intelligent in that they can be trained a variety of tricks and commands and can be litter boxed trained. They love to be with their family and will show their disapproval if neglected. 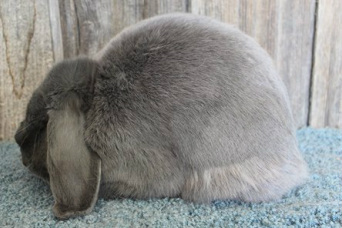 The ideal Mini Lop is described as being a "basketball with a head". Judges like to see a nice rounded body with thick depth, long thick ears, a wide head and thick bone. The Mini Lop rabbit is classified as a medium sized rabbit. Senior Bucks and Does must be six months of age and older and weigh no more than 6.5 pounds (3 kg). Ideal weight is 5.5 pounds (2.5 kg). Juniors Bucks and Does must be under six months of age and weigh less than 6 pounds (2.7 kg). The various colors within a variety are not judged separately. They are divided for judging into two groups, classifications, solid and broken pattern. General Type: When viewing the Mini Lop, one should see a rabbit that gives the general appearance of a massive, thick set, heavily muscled body. The animal should have a good balance of width and depth, allowing for a slight taper from the heavier hindquarters to the shoulders. There should be a good top line starting at the base of the skull and rising over the spine, with the peak over the center of the hips. The hips should be smooth, deep, well rounded and full in the lower hips. Faults: Long narrow body, chopped or undercut in the hips, and flat shoulders or hips. Head: The head of the Mini Lop Rabbit should have strong and bold features. The head is to be set closely on the shoulders, with the neck as short as possible. The crown of the head is very boldly arched. There is a slight curvature of the skull from the base of the crown down towards the nose. The head should appear to be wide and have a well filled muzzle. The size of the head should balance with the body. Buck heads are usually wider than doe heads. Faults: Long narrow head, pointed nose, concave or flat crown. Ears: The ears of the Mini Lop carry as many points as the head. The ears should rise from a strong base ridge and then loop vertically on both sides of the head, thus giving a horseshoe appearance. The ears should lie close to the cheeks, with the ear openings turned toward the head. The ear length should he about .75 to 1 inch (2 to 3 cm) below the jaw and balance with the size of the animal. The ears should be well furred and rounded on the ends. Faults: Poor ear carriage, folds in ear, extremely thin or thick ears, and ears turning away from the head. Legs & Feet: Legs are important for good type. They should be straight, short, and thick. Toenail pigmentation can be either light or dark in the broken group. The front and rear nails may vary in color, but all front toenails must match and all rear toenails must match. Faults: Unmatched nails in broken colors. Disqualifications: General toenail disqualifications apply on all solid pattern groups. Fur: The Mini Lop fur is very thick and dense. It should be glossy and lustrous. It is medium in length with a good roll back. Faults: Long, thin, silky, harsh or extremely short fur. Color: Mini Lops come in many beautiful colors. When making a selection of stock, color really should be the last consideration before making your choice. Type should always be considered first. When judging, color points are divided equally between color and markings. The broken pattern includes any recognized color group in conjunction with white. A butterfly marking on the nose with wings outlined in white is preferred with colored eye circles and both ears colored. The body should have either a blanket or patched markings. Front feet should be white and rear feet may be white. Solid pattern includes any recognized color group. Faults: Lacking complete head markings, light body markings, and excessive white hairs in a solid pattern. Eyes: They may be any color, but must match each other. Disqualifications: Eyes that do not match. Foreign color spots in rabbits of the solid pattern group. 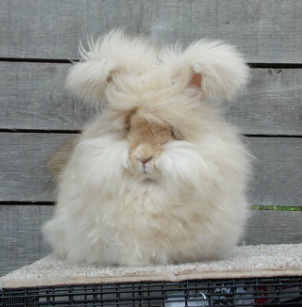 remarkable creature that can look more like a Pekinese dog than a rabbit.